A poke is a facebook application that has been added to every account on facebook. On your homepage, a small box on the right hand side (See Image) called “Pokes” is visible if anyone has poked you. The pokes are nothing but small images of a hand with a finger pointing, and displays the person’s name who sent the poke to you. Pokes can be just a way to say hello / hi to anybody on Facebook. You can send pokes to anyone, not just your friends and anyone can poke you as well. 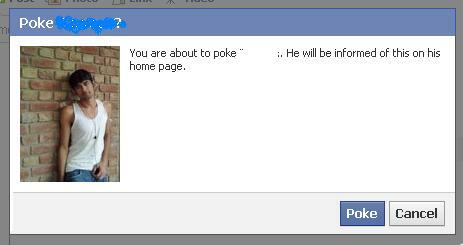 To poke someone, go to the person’s Facebook profile page and click on the “Poke” link beneath his or her profile picture. You’ll get a pop-up message asking for confirmation. Once confirmed, the poke is sent. If someone pokes you, you can also poke them back or hide the poke. If you hide the poke, it disappears forever. When you send a poke to someone on Facebook, that person will be able to view your basic information, work information, and education information on your profile. This occurs even if your profile is set to private and the person you have poked is not on your friends list. However, this profile access is temporary. If you want to view private profiles on facebook. Just poke the person whose profile you want to see. If that person pokes you back, you will get the chance to see basic information, work information, and education information from his / her profile.